NEWFIELDS — When members of the town’s Police Department heard they might be able to help a local family whose 3-year-old son is battling cancer, they didn’t hesitate to act. The department recently secured a $5,000 grant for the Silvani family through Cops for Kids with Cancer, a Massachusetts nonprofit which provides funds directly to people involved in the care of children with cancer. “We’re so appreciative,” said Jacqui Silvani, whose 3-year-old son, Joe, was diagnosed with Stage IV neuroblastoma in June. Neuroblastoma is a type of cancer that develops from immature nerve cells found in several areas of the body and is very difficult to treat. It is one of the rarest types of childhood cancer with only 700 cases diagnosed each year. Joe’s symptoms were first noticed by a teacher at Appleseed Day School in Exeter in June, when she observed Joe’s face was red and sweaty on one side, but completely normal on the other. He was displaying a condition called Horner’s Syndrome, which can be caused by several things, the rarest of which is a tumor. Joe was taken to Boston for testing and doctors found a primary cancerous tumor in Joe’s neck, with spots on his spine and hip. Since then, he has gone through six rounds of chemotherapy, radiation and a stem cell transplant phase, which aim to get his immune system running again. In July, Joe’s own stem cells were harvested from his blood, then stored for a future transplant. He has been at Boston Children’s Hospital for about 4½ of the past six months. Joe has responded well to treatment, but there have been complications along the way. For the past week Joe has been hospitalized due to a fever, which needs to be monitored at the hospital as it could be a sign of infection. Just as he was preparing for discharge, he developed a strep infection. “They’re trying to do everything they can to get us out by Christmas,” Jacqui said. Jacqui and Joe have only been home for more than one week without an admission to the hospital once since his diagnosis in June. Joe’s father, Adam, is still working and caring for their other two children Maddie, 8, and Jackson, 6, while Jacqui stays with Joe. While chemotherapy is designed to eliminate the cancer cells that can be found on a scan, Jacqui explained that neuroblastoma is a particularly “tricky” form of cancer that moves around and hides in places where it is not detected on a scan. The stem cell transplant aims to help wipe out any cancer hiding in Joe’s bone marrow. So while a scan of Joe at the end of October found no cancer, his comprehensive treatment is expected to continue through next summer. The family has been surviving on one income as Jacqui took a leave from her job as a math specialist with the Andover, Mass., school system after her son’s diagnosis. They are currently paying their $1,700 per month health insurance premium out of pocket. Funds raised for the family will help tremendously as they deal with medical expenses and the frequent trips to Boston. Maddie and Jackson are both students at the Newfields Elementary School and the family is grateful for the support from the teachers and staff at the school. Though the Silvanis have only lived in Newfields for about a year and a half, Jacqui said they have been touched by the generous spirit of the small community. People in her hometown of Seabrook have also come forward to help with fundraisers. “The support from the communities in the area has been amazing,” she said. Helping the Silvani family ties directly into the Newfields Police Department’s community policing philosophy, Chief Art Reed explained. 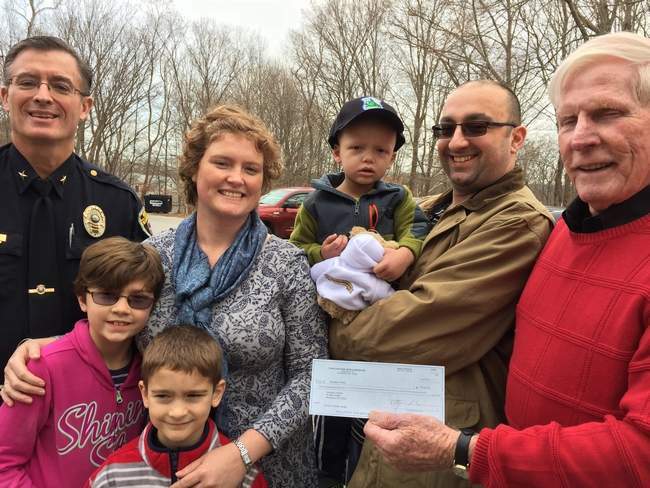 Cops for Kids with Cancer Chairman Robert Faherty, a retired superintendent-in-chief of the Boston Police Department, traveled to Newfields on Dec. 13 to meet the Silvani family and present them with a check. He also gave Joe a hat, teddy bear and other gifts. Reed explained that while police work often includes upholding laws, it is also about helping residents in the community.